There are over 10,000 near-Earth objects (NEOs) that have been identified so far, asteroids and comets of varying sizes that approach the Earth’s orbital distance to within about 28 million miles (45 million km). Of the 10,000 discoveries, roughly 10 percent are larger than six-tenths of a mile (one kilometer) in size – large enough to have disastrous global consequences should one impact the Earth. First discovered in February 1950, 1950 DA is a 1.1-km-wide asteroid that was observed for 17 days and then disappeared from view. Then it was spotted again on Dec. 31, 2000 — literally the eve of the 21st century. 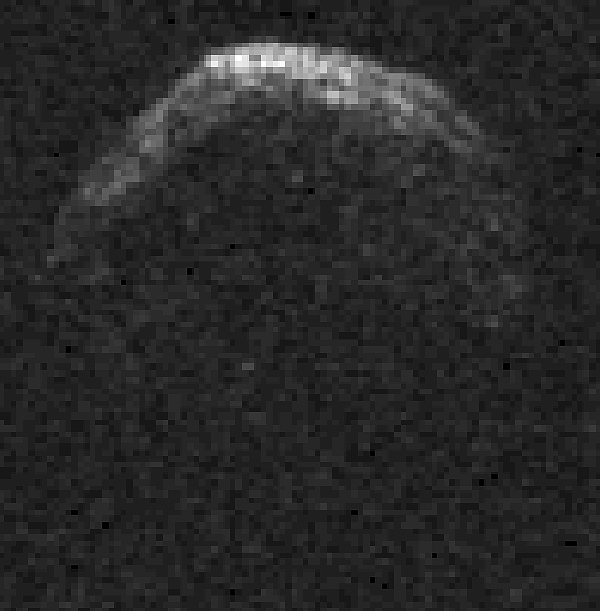 Coupled with radar observations a few weeks later, in March 2001, it was found that, along with a rather high rotation rate (2.1 hours) asteroid 1950 DA has a trajectory that will bring it very close to Earth on March 16, 2880. How close? Close enough that, within a specific 20-minute window, a collision can not be entirely ruled out. The image above was made from radar observations by the Arecibo Observatory in Puerto Rico in March 2001, when 1950 DA passed within 7.8 million km of Earth. Are we looking at the mug shot of a future continent-killer? Radar analysis and research of 1950 DA performed by JPL scientists J.D. Giorgini, S. J. Ostro, Don Yeomans and several others from JPL and other institutions revealed that the impact probability from this asteroid is, at most, 1 in 300 (and probably even more remote*) based on what is known about the asteroid so far. At its greatest this could represent a risk 50% greater than that of the average background hazard due to all other asteroids from the present era through 2880. There are many factors that influence the path of an asteroid through space. Its spin rate, reflectivity (albedo), composition, mass, terrain variations… gravitational interactions with other bodies… all these can affect the movement of an asteroid and, more specifically, its exact position at a future point in time. And while many of these things aren’t precisely known for 1950 DA, one in particular could end up being a saving grace for Earth’s future generations: the Yarkovsky effect. A small but important force acting upon asteroids, the Yarkovsky effect is a “nudge” created by thermal emission. As an asteroid gathers heat energy from the Sun, it releases some of that energy back into space. Thanks to Newtonian mechanics the act of doing so creates a physical push back on the asteroid itself, altering its course ever so slightly. Over a long span of time, this slight alteration could result in the relocation of 1950 DA away from the spot in space where Earth will be on March 16, 2880… enough so that a miss is certain. Recent research by JPL scientists D. Farnocchia and S.R. Chesley (paper submitted Oct. 2, 2013) have taken into consideration the Yarkovsky effect on 1950 DA based on known values from previous observations, as well as new research suggesting that the asteroid has a retrograde rotation. Their assessment puts the risk of an impact in 2880 within the lower end of the probability spectrum (-0.58 on the Palermo Scale) but is far from zero, and is in fact still higher than any other known possible impacts. But again, precisely where 1950 DA will be in another 866 1/2 years and whether or not it will be occupying the same point in space as our planet relies on many factors that aren’t well known — even though its orbit is pretty well understood. More in-depth observations will need to be made, using both optical and radar imaging techniques. Luckily, 35 generations offers plenty of time to improve our knowledge. If it is eventually decided 1950 DA needs to be diverted, the hundreds of years of warning could allow a method as simple as dusting the surface of the asteroid with chalk or charcoal, or perhaps white glass beads, or sending a solar sail spacecraft that ends by collapsing its reflective sail around the asteroid. These things would change the asteroids reflectivity and allow sunlight to do the work of pushing the asteroid out of the way. Learn more about ongoing NEO research on the JPL site here, and find out about asteroid-hunting programs like NASA’s repurposed WISE spacecraft and the proposed Sentinel spacecraft from the B612 Foundation. Because in order to learn more about NEOs, we first need to find them… and there are a lot more out there where 1950 DA came from. *UPDATE: A year after this was posted, further observations of 1950 DA showed that the asteroid is more of a flying clump of rubble than a solid chunk of rock, and this greatly influences the mass of the asteroid and how it responds to different forces acting upon it. As a result the chances of it ending up on an impact trajectory with Earth are more like 1 in 4,000 than 1 in 300, and that’s pretty unlikely. Not zero, but unlikely. Read more here from Phil Plait. Previous Post It Wasn’t a Rock, It Was a Rock COMET! In the year 2880 I´m 100% sure that humanity will have the tecnology to keep away this rocks….from my point of view the space junks looks a more serious threat for humans.